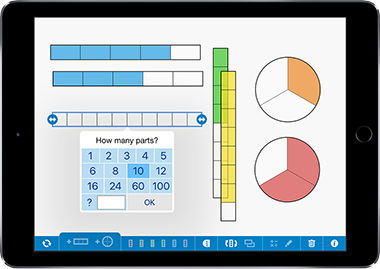 Fractions, by the Math Learning Center | Clarity Innovations, Inc.
Fractions lets students use a bar or circle to represent, compare, and perform operations with fractions with denominators from 1 to 100. Choose the fraction model and number of equal parts. Use a color to select specific parts to show a fraction of the whole. Reveal or hide numeric labels as needed. Superimpose fractions upon each other to compare fractions or see equal parts.